Red potatoes are a firm, thin skinned vegetable perfect for many recipes. 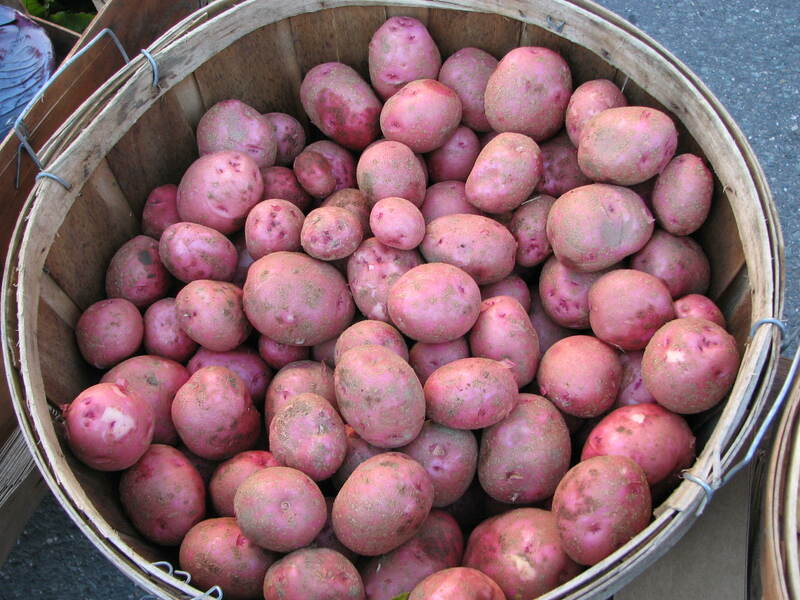 Current Facts: Of the more than five thousand varieties of potatoes in the world, the most common variety in the United States is the Red potato. Red potatoes are often labeled as “new potatoes’ though this a reference to a potato harvested immaturely. Red potato varieties can grow beyond 2” in diameter and length. Description/Taste: Though there are literally hundreds of varieties of Red potatoes the most common Red potato is ruby red smooth-skinned with a waxy firm white flesh. Red potatoes are roughly rounded to oval in shape and small to medium in size. The entire potato is edible. Their flavor is more robust compared to many pale skinned varieties. The Red potato holds its shape well and should be used beyond the assumed baking and frying recipes. About Yukon Gold Potatoes It’s got such a potent name. The Yukon Gold. Burly, brawny, capable and of course, golden. Yukon Golds fall somewhere between Idaho potatoes and red potatoes in terms of texture. They are lower in starch content than La Sodas, Idahos or russets. Hearty and golden, this all-purpose spud is good for any potato dish. Yukon Golds actually do come from the North Country. They owe their existence to the potato-breeding program at Canada’s University of Guelph, in Ontario, where a team of researchers crossbred a North American white potato (Norgleam) with a wild, South American yellow potato. The result was the Yukon Gold. It was officially licensed in 1980 and then exported to the United States and beyond. Yukon Golds are identified by their thin, light gold skin and yellow “meat.” The yellow color comes from anthoxanthins, which are a type of flavonoid also found in onions, apples and cauliflower. 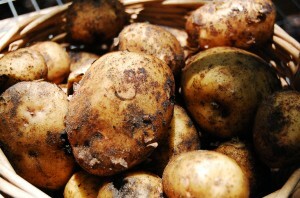 Yukon Golds are slightly higher in sugar than other potatoes, which means they do not store as well as other potatoes. Keep them in a paper bag or perforated plastic bag in the fridge and use within a week. Wash and scrub before using. They don’t need to be peeled: being organically grown, their skin is safely edible and delicious, as it concentrates a lot of the flavors. Store potatoes in a cool, dark, well ventilated place for use within 3-5 weeks. Look for clean, smooth, firm-textured potatoes with no cuts, bruises or discoloration. Store potatoes in a cool, well ventilated place. Colder temperatures lower than 50 degrees, such as in the refrigerator, cause a potato’s starch to convert to sugar, resulting in a sweet taste and discoloration when cooked. If you do refrigerate, letting the potato warm gradually to room temperature before cooking can reduce the discoloration. Avoid areas that reach high temperatures (beneath the sink or beside large appliances) or receive too much sunlight (on the countertop). Keep potatoes out of the light. Don’t wash potatoes (or any produce, for that matter) before storing. Dampness promotes early spoilage. Green on the skin of a potato is the build-up of a chemical called Solanine. It is a natural reaction to the potato being exposed to too much light. Solanine produces a bitter taste and if eaten in large quantity can cause illness. If there is slight greening, cut away the green portions of the potato skin before cooking and eating. Sprouts are a sign that the potato is trying to grow. Storing potatoes in a cool, dry, dark location that is well ventilated will reduce sprouting. Cut the sprouts away before cooking or eating the potato. Wash before use. Because red potatoes have thinner skins, they should not be cleaned with a brush. When peeling, a vegetable parer is recommended because some of the potato’s nutrients are close to the skin. Potatoes should not be exposed to light; this can cause them to turn green, making them inedible. Sometimes potatoes that are cut and uncooked take on a pinkish or brownish discoloration. It’s due to the carbohydrate in the food reacting with oxygen in the air. Potatoes that become discolored are safe to eat and do not need to be thrown out. The color usually disappears with cooking. The following nutritional information is for one medium red potato.